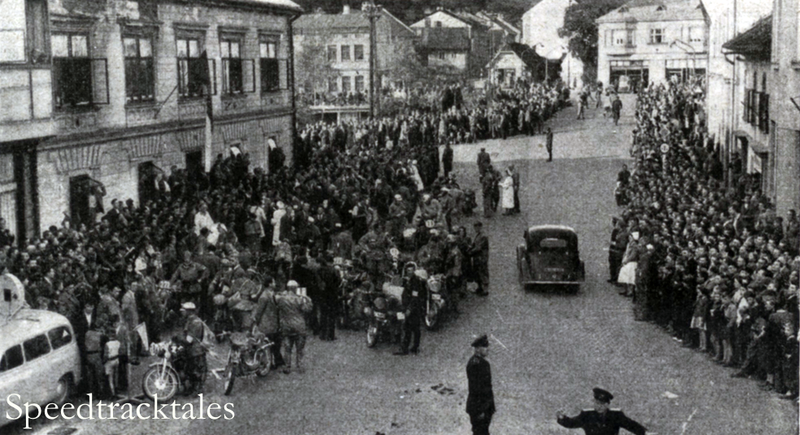 The welcoming opening ceremony with brass band on stage, at Gottwaldov (Zlin) in Czechoslovakia (Czech Republic), in Drevnice Valley to the lower west of the Carpathians, 6.45am local time the first machine came from parc ferme, 236 Riders from 18 nations started, 122 Gold Medals were awarded 62 retirements came about, the first control from Gottwaldow, Kunovice had vast crowds lining the route township buildings were draped with flags, flowers & bunting, sport proclaimed to be the link with peace between nations, small girls handed flower posies to riders, calm had reached areas hard hit by the harshness of terrible war, even another brass band at Kunovice. 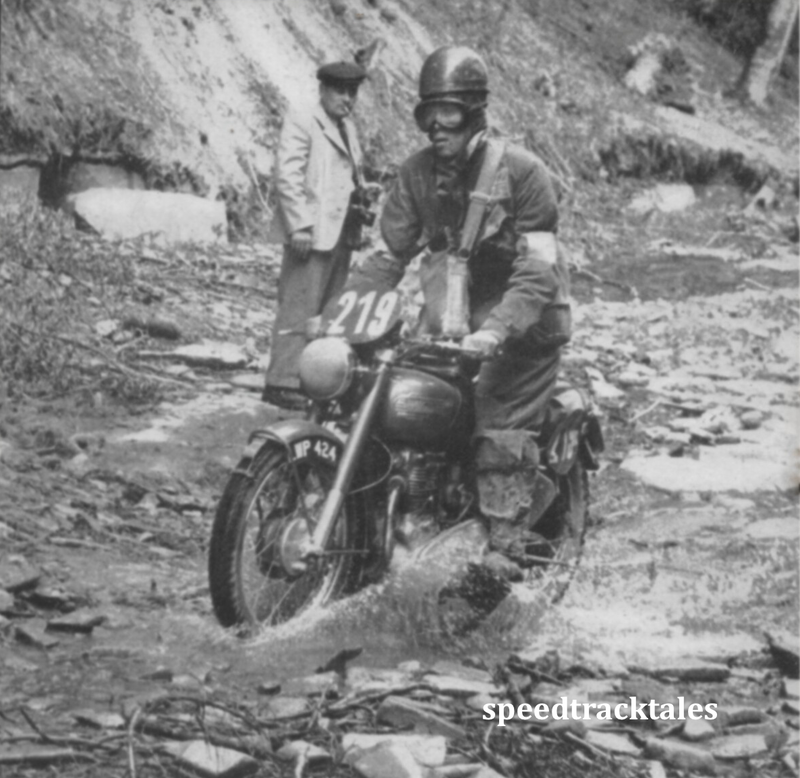 The fine weather promised seemed reluctant to show, dampness plus dripping condensation was met. 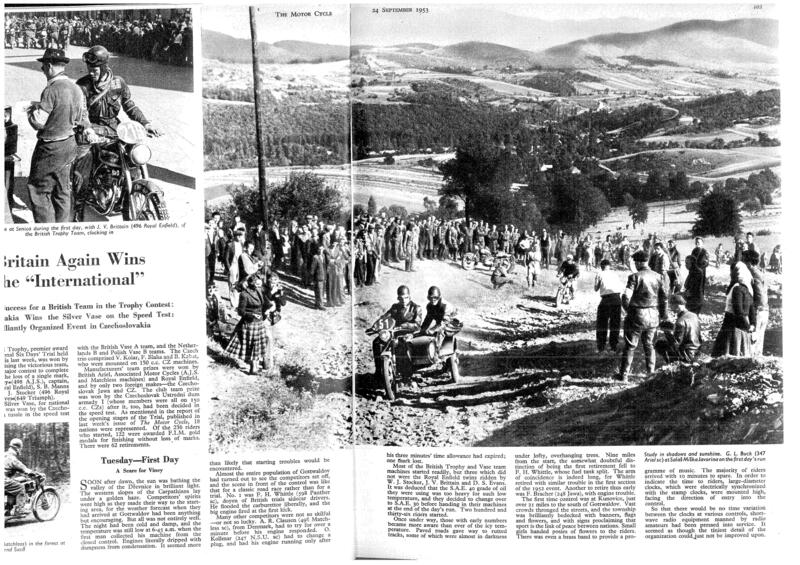 The following photos come from our archive copy of ‘Motor Cycling’ report on this ISDT in the issue of 24 September 1953. 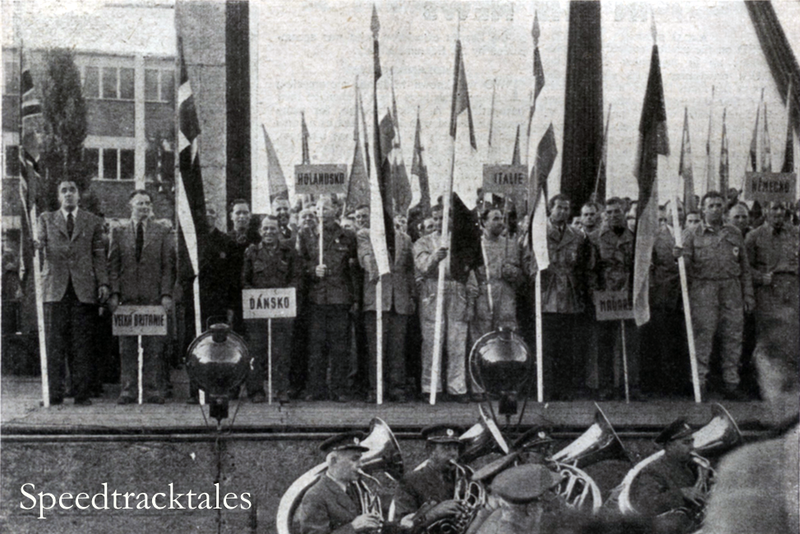 In the opening Parade of the Teams included the teams from Great Britain, Austria, Czechoslovakia, Germany, Hungary, Sweden. 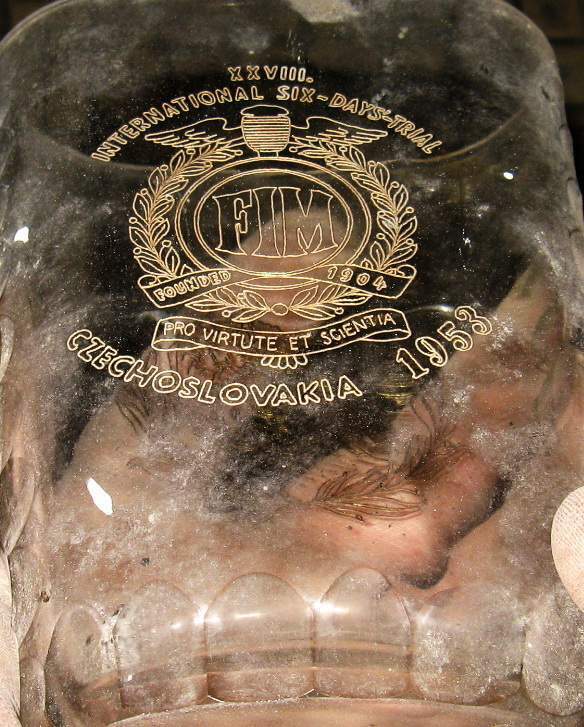 Vase ‘A’ teams: Great Britian, Austria, Bulgaria, Czechoslovakia, Germany, Holland, Hungary, Poland, Rumania, Sweden, Switzerland. 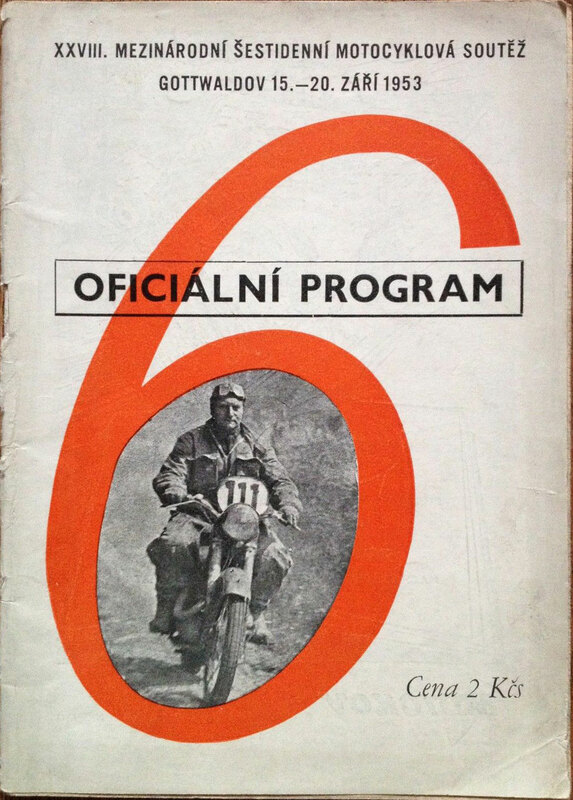 Vase ‘B’ teams: Great Britain, Czechoslovakia, Holland, Hungary, Poland, Rumania, Sweden. 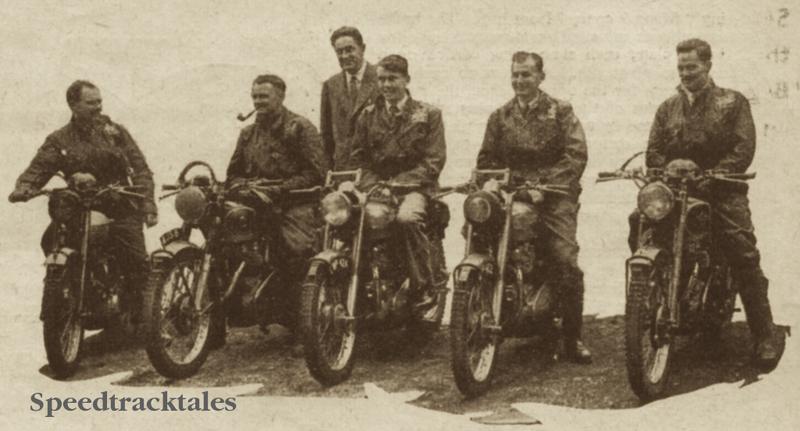 Johnny Brittain pictured above in his team Barbour ‘International’ Jacket is the son of Vic Brittain, who was one of the most successful successful ISDT and observed trials rider of the pre war era who retired from the ISDT in 1949. 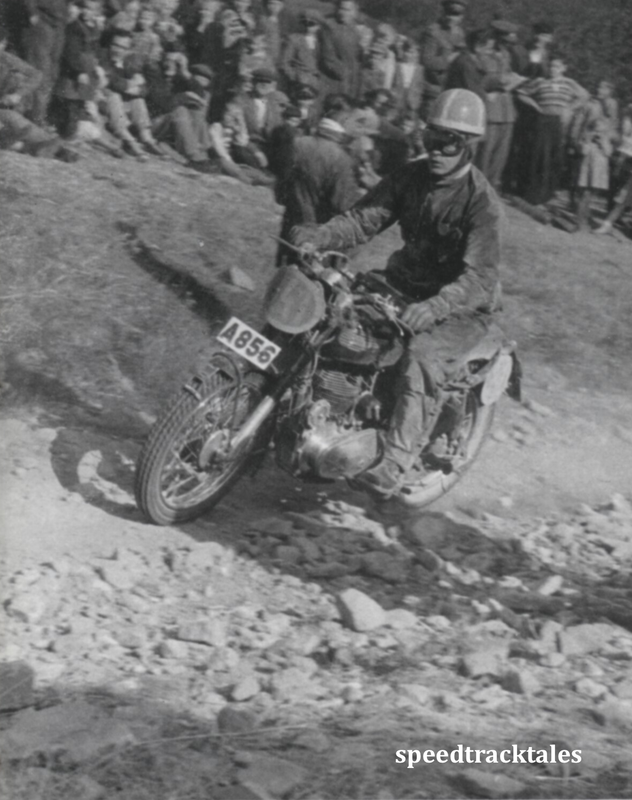 Johnny was a successful trials rider himself. The event is underway in earnest. 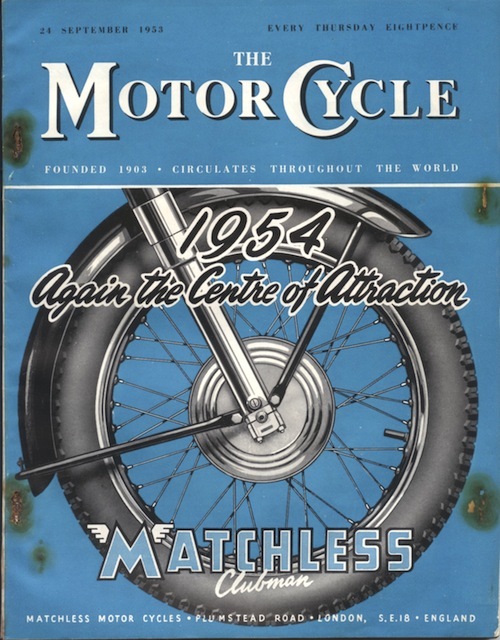 Eastern bloc machinery was beginning to be far more competitive as the little 2 strokes had been for many years, superior Italian machinery had been the bane of British bike makers & the Oriental machinery challenge had not really begun, look today at what still exists as the supreme machinery, Norton & Triumph try to resurrect the Marque, Royal Enfield Plods on. 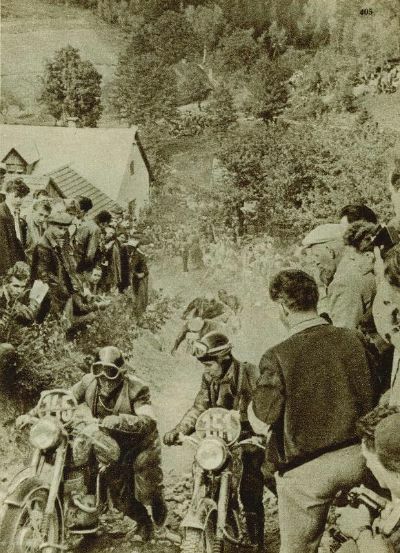 A second control point at Seneca, another Big British Twin with S B Manns on the Matchless 500cc inforest route near Hornd Suca, first aid posts abounded along the route. 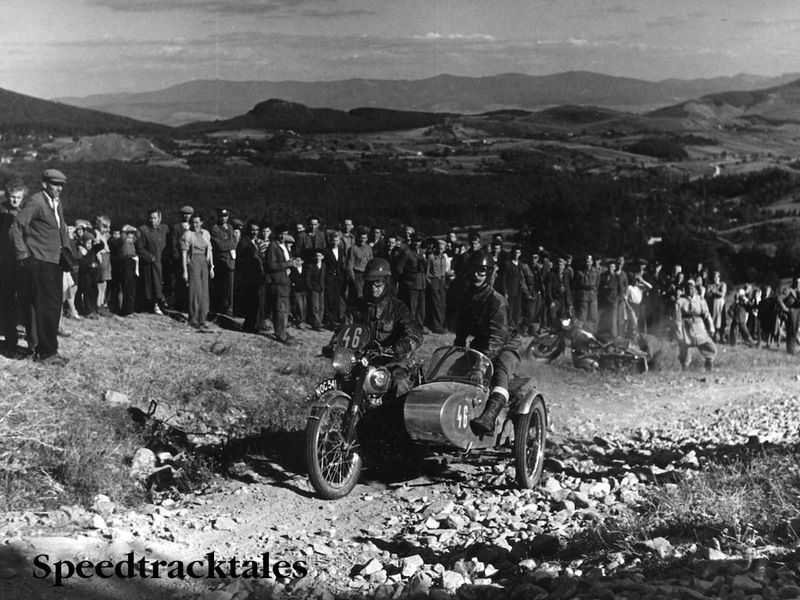 Washing, fuelling & other facilities were frequent, a British retirement was noted to be E Wearden on 124 Anelay-Excelsior, Border crossings between Moravia & Slovakia led to lunch stop at Bratislava between the Danube River & southern Carpathians. 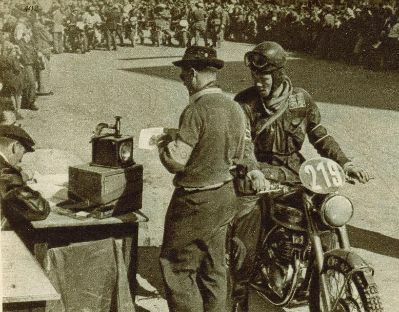 The second day start start saw S Klimit fail to start his 250cc Jawa within the allocated 3 mins. 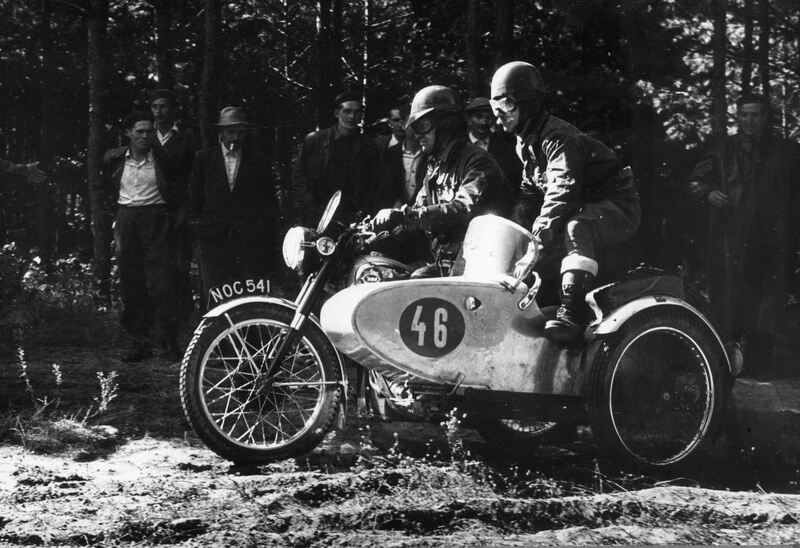 then efficient Swedish Trophy Team man E Forsberg failed to start his 246 NV. 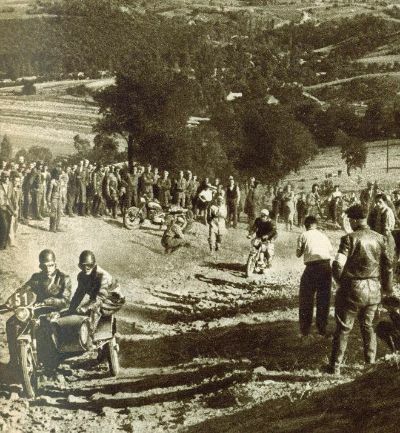 In the background Hugh Viney had changed rear tyre & tube plus headlamp liesurely washing his hands afterwards all within the 15 permitted minutes of an official 10am start to allow for the darkness portion to follow later. 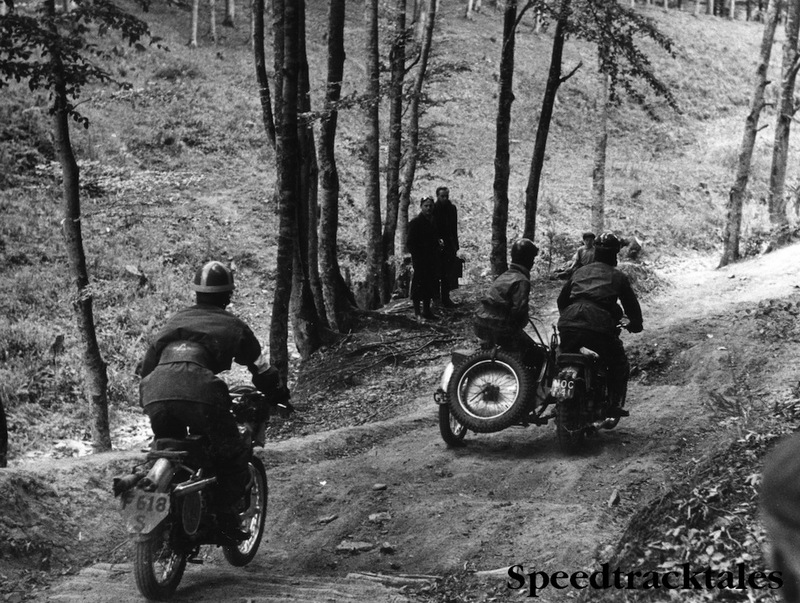 the course led southeast to the Carpathians & lower Tatras, 29 plus miles to first check at Slavicin, on to Horna Suca, the climb to Na Hancich mountain & through known Wolves & Deer haunts with rough going along most tracks. 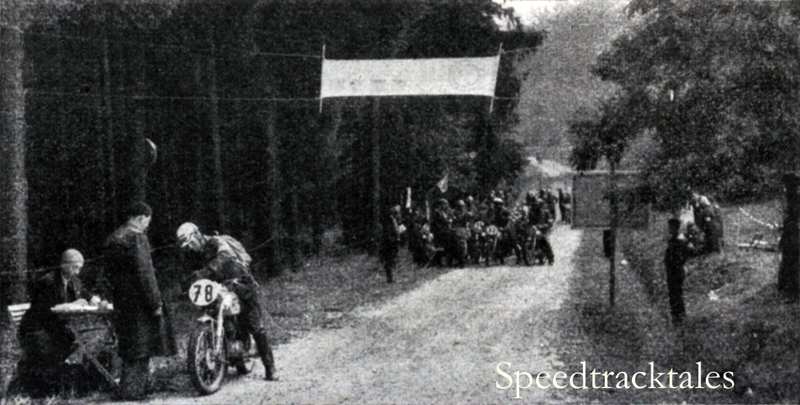 Sweden’s Trophy hopes foundered when Forsberg’s machine simply gave up before reaching the Puchov Control Point, G Ravinale holed his 175cc Morini crankcase & retired, H Sprung’s 125cc IFA had it’s frame part beneath the steering head. 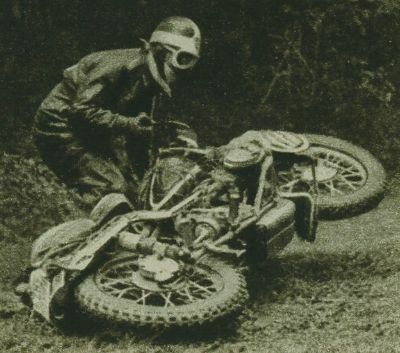 Britain’s A W Glassbrook BSA had dropped it to avoid a car & even with split Fuel tank holed chaincase & sprained foot, still getting home with 10 mins to spare. 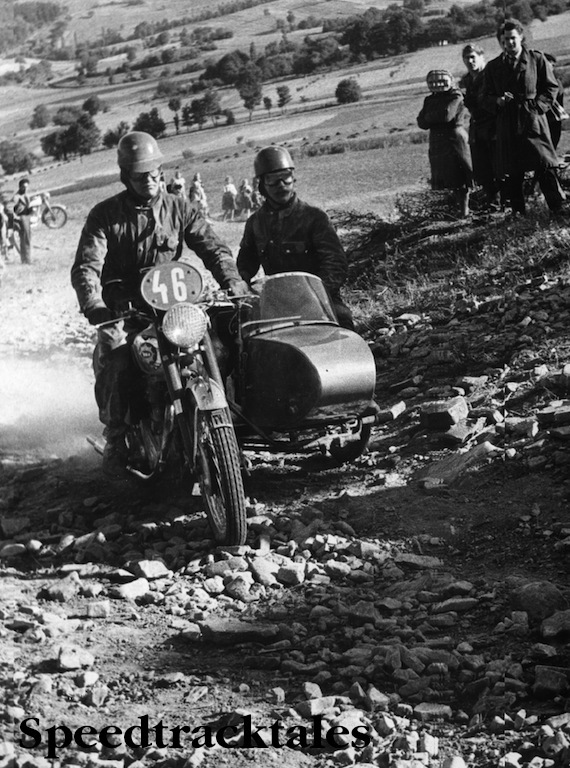 2 more frame breakage retirements were E Longoni 175cc Guazzoni & J M Ivanov 150cc CZ. Hosts treated competitors well at the lunch halt. 7pm! 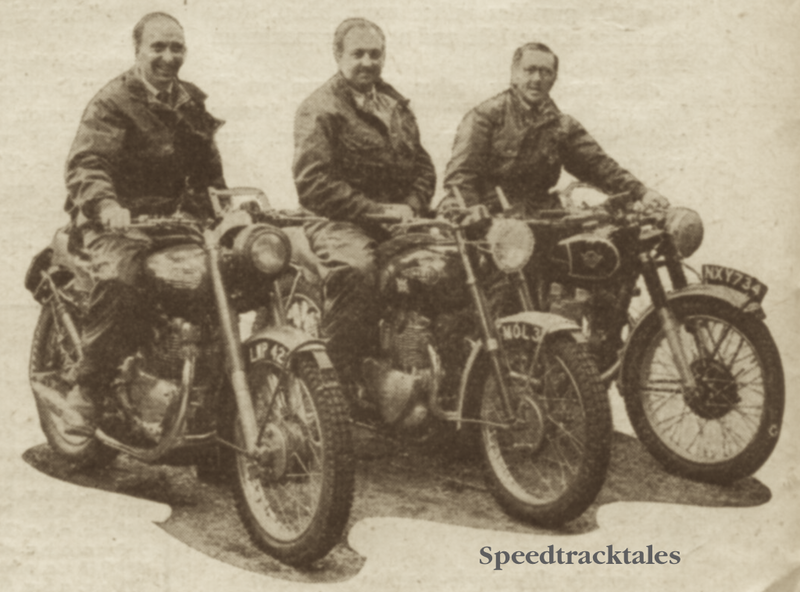 the 63 miles night route from Piestany to Gottwaldov began, seven riders of Hungary, Bulgaria, Romania on Jawa & Csepel machinery lost marks for lighting faults. 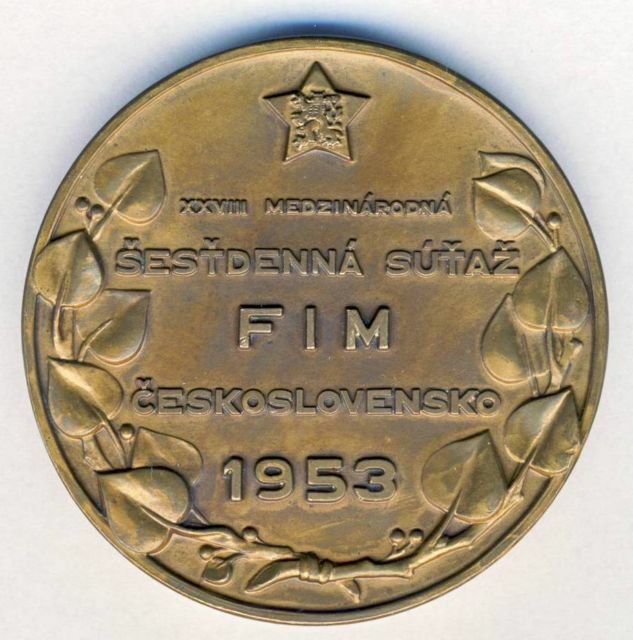 Czechoslovakia had lost ONE Point, Sweden 100, Hungary 2003, Britain plus Western Germany had still lost no points. 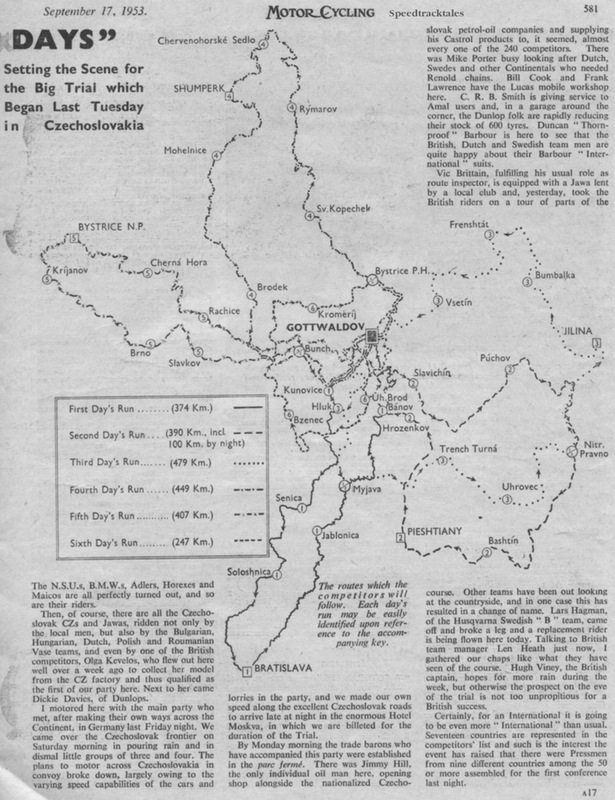 Following day, the 3rd day started at 5.30am! 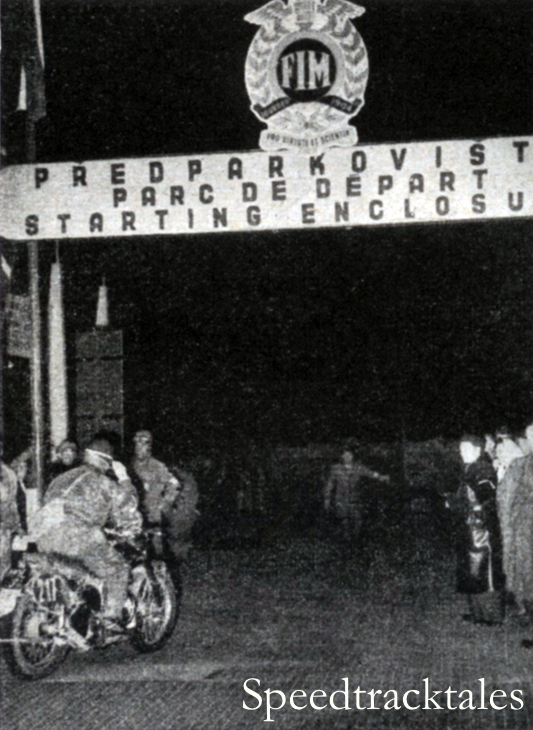 Day 3 first control was at Hluk 63 miles away, H Veer of Netherlands lost 14 marks changing out ignition parts on his 247cc JAWA, Control at Cavoj led to rough ground tracks along to control at Nitrianske Pravno, then the route went higher to ranges of Strazooska Hornatina & Mala Fatra, 1 in 4 climbs followed with burned Clutch smells & queues to get onto sections upsetting all. 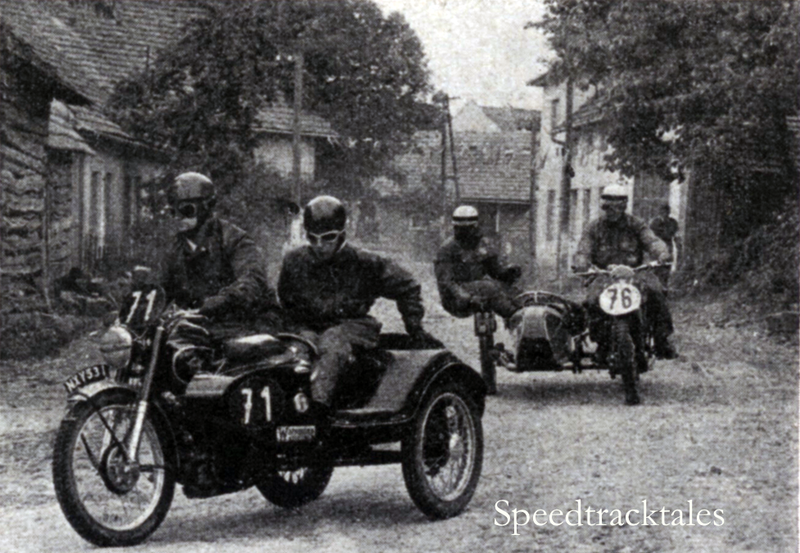 West Germany’s Walter Zeller’ BMW had suffered a previously unheard of completely fractured crankase & this placed Britain in a stronger position, there was much more time to come. 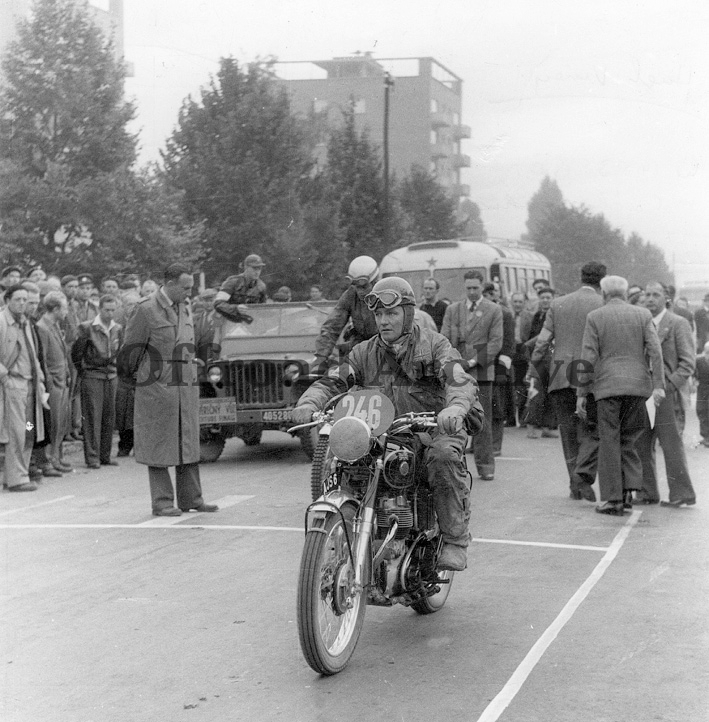 After this, a 4th Day began, for a 212 miles route, several 150cc CZ riders, along with Netherlands C J Langeveld trying to repair split fuel tanks. 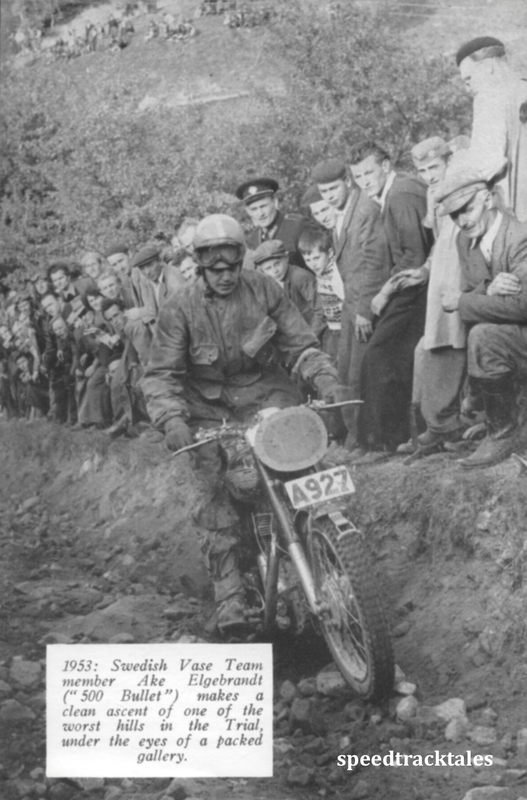 K G Nyman 174cc Husqvarna rigging his suspension unit with wire, Britain’ non team member P F Hammond had his Triumph motor seize & later sound bad! 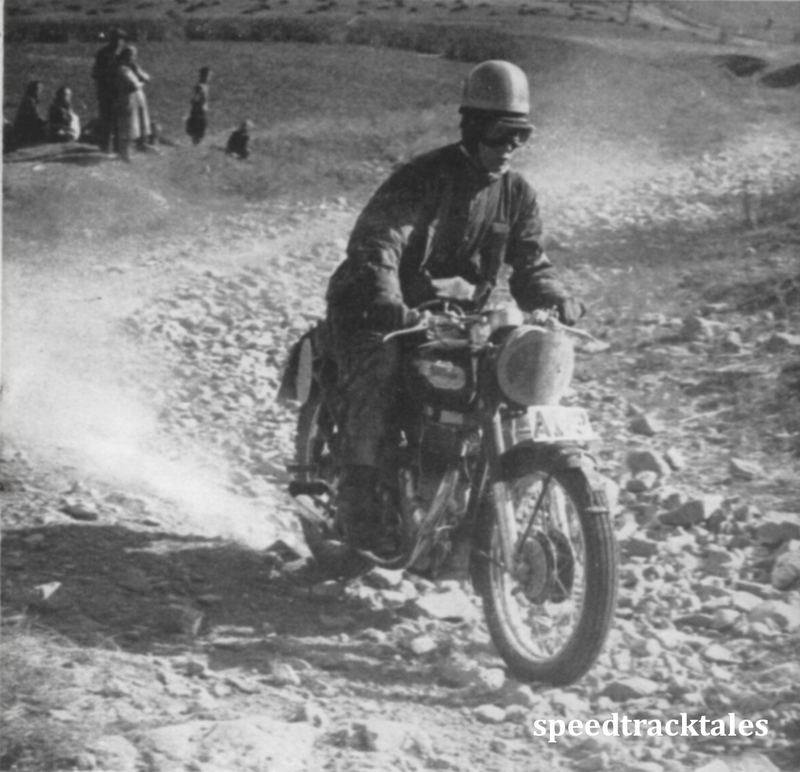 & eyebrows were raised whe J V Brittain’s Royal Enfield actually required a second kick to start it. 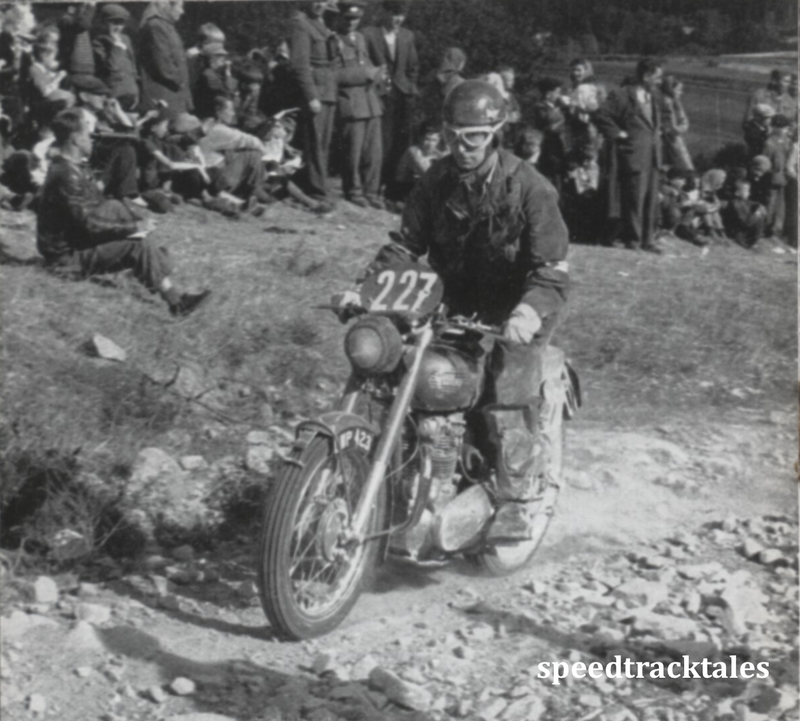 On to Hostynske Orchy Mountains, via a Bystrice pod Hostynem checkpoint, B L Jansema of Netherlands Vase ‘A’ team intermittently lost ignition on his 248cc Jawa, this amounted to 20 lost Points for the day. 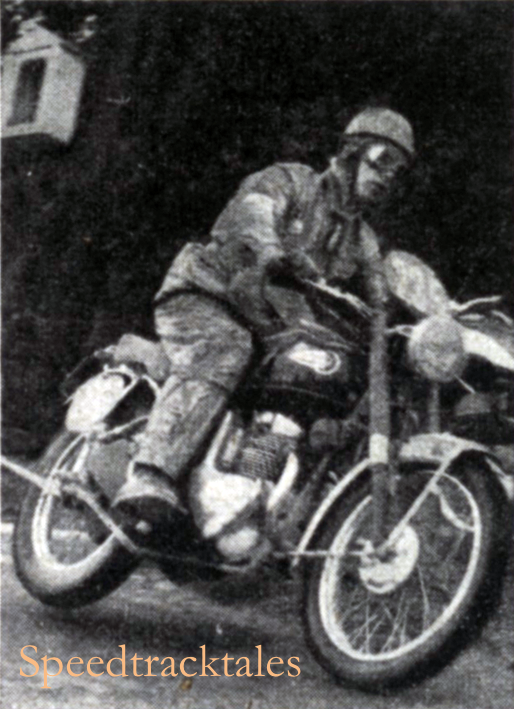 Next control St Kopecek then to near the Polish Border then on to Rymarov via high wooded ground to Cervenohorske sedlo, here Jack Stocker extracted a 6″ nail from the tyre of his 500cc Royal Enfield, the Dunlop repair held, rest taken at Sumperk, then sharply downwards to Oskava. 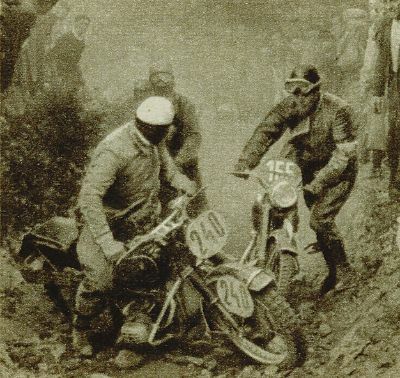 On to 5th Day, Easterly winds, fairly strong brought dustclouds Western Germany’s hopes of getting the Silver Vase diminished when W Aukthum’s 174cc Maico failed to start & leave the line. 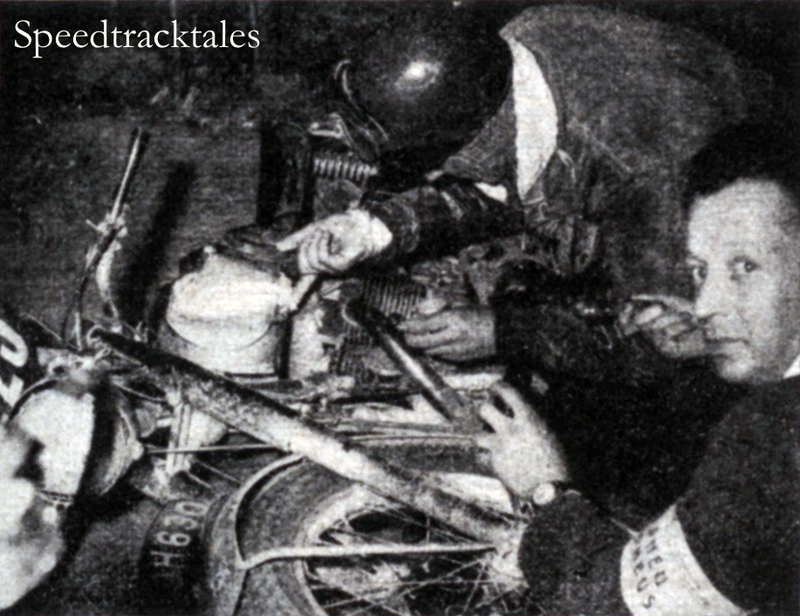 R W Wagger’s BSA 350cc Sidecar Ball joint parted & became lashed together shortly later to be excluded from travelling further. 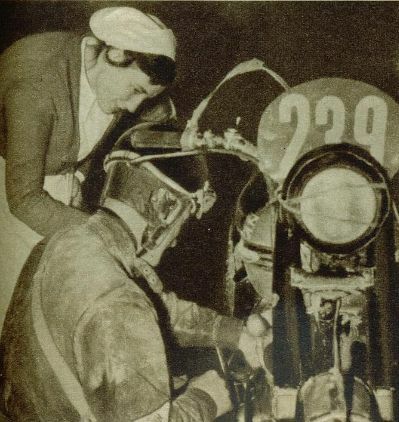 Olga Kevelos, Mrs Molly Briggs 197cc DMW was unpenalised though changing plugs every few miles for her unhealthy sounding Villiers & Miss Rutlova lost no marks on her 248cc Jawa. 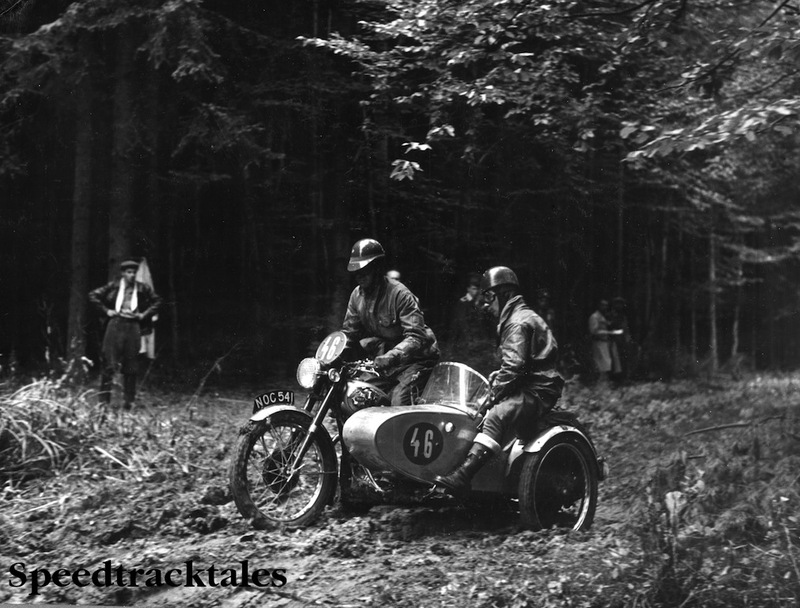 I know that helmet pattern may cross your mind, F Camathias of Switzerland rights his BMW 500cc in Horna Suca forest mud, yes it is Florian Camathias in days before the bespectabled hero of Sidecar Racing hit the world scene & impressed ALL. 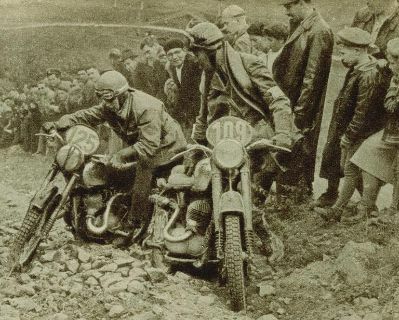 During the 5th Day Johnny Giles of British Vase ‘B’ Team lost compression on one cylinder of his Triumph on rough going at Bunc, B Erikson 174cc Husqvarna of Sweden’s Vase ‘B’ had his tyre valve rip out, the replaced tube was then punctured by a nail! 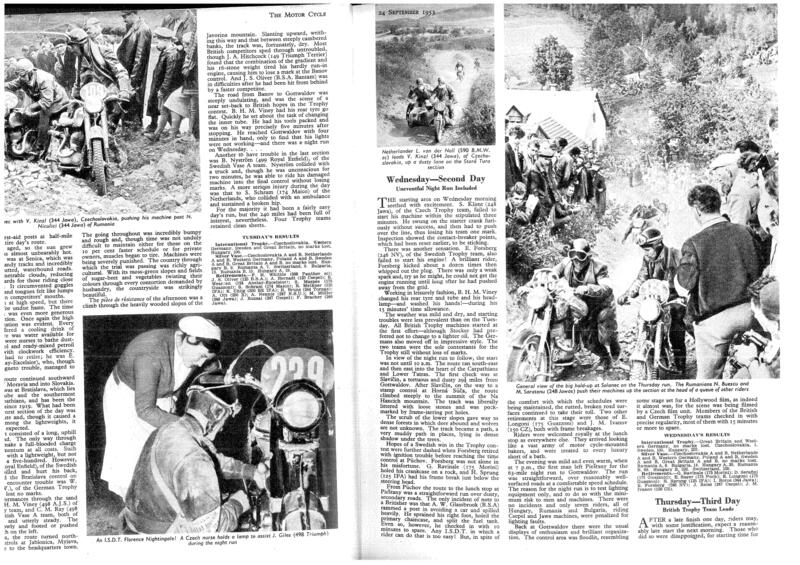 to cost him 12 marks & the Team the Vase, 193 rides had started, 16 had retired, to bring the retired total to to 59 177 competitors remained, 136 had lost no marks in a day’s mileage of 257. 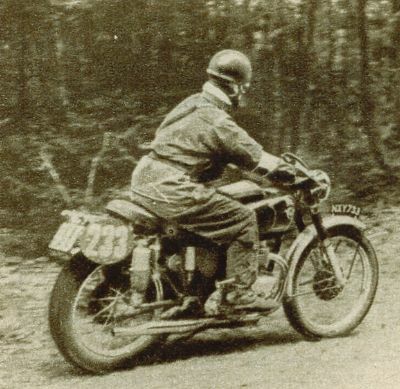 Georg Meier that Great BMW rider from Germany who raced before & after WW2 and we have a feature on this very bike that is still alive and well and fully restored. 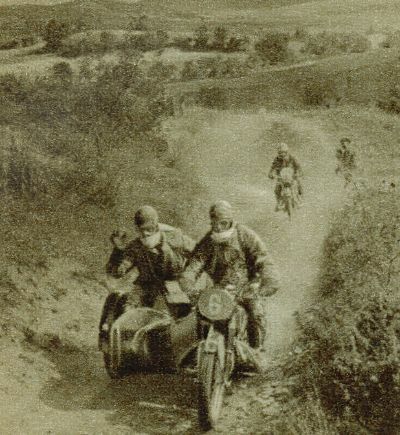 The Sixth day with machinery in unexpected states provides great days for some & tentative ones for many, rain before speed test is another ‘ooh er’ causant when tank splits tyres & other factors mount, J Cizek of the Czech Vase ‘A’ Team fell too heavily with his Jawa 248cc to continue, Molly Briggs had 2 punctures on her 197cc DMW & was forced to retire, Olga Kevelos crashed as well as P H ‘Jim’ Alves of the British Trophy team but both got up to carry on. 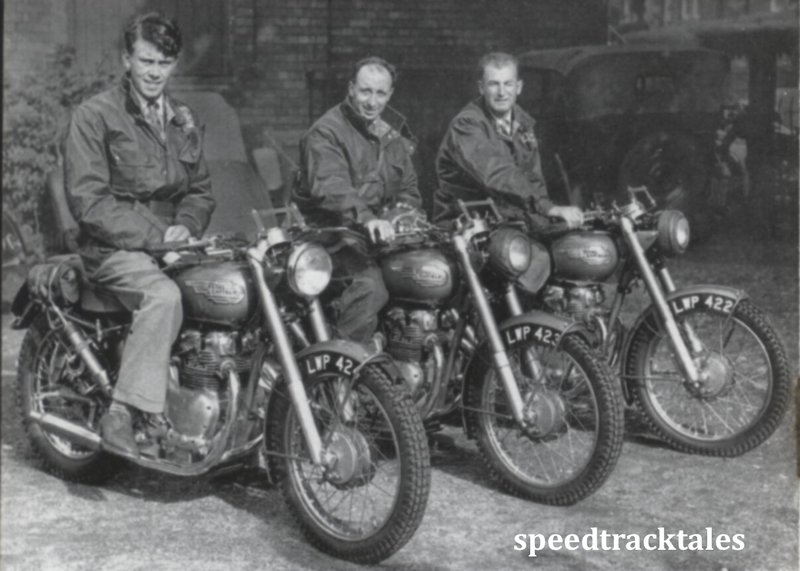 British Trophy Team lost no marks in the Morning & only faced the speed trial of 20 laps on the Racing Circuit, this they did and even crossed the line in formation, youngsters today would perhaps applaud Hugh Viney’s run along the straight with his feet on the seat after getting the signal from Len Heath that the Trophy was theirs. 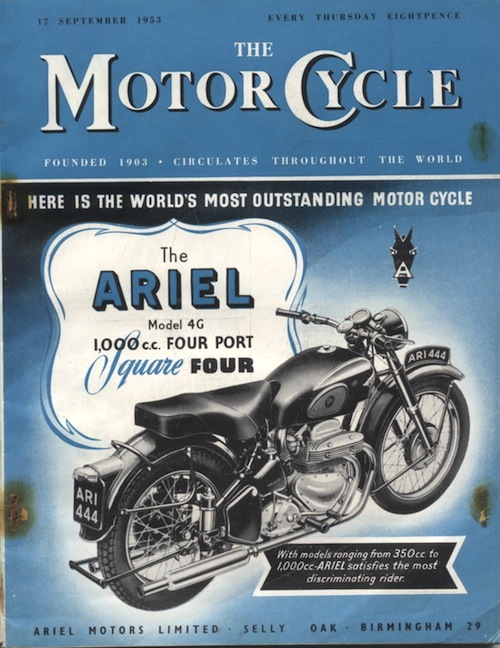 Ariel AMC & Royal Enfield finished the event having lost no marks at all along with Jawa & CZ. 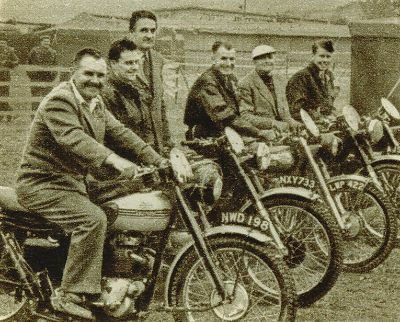 The successful British Trophy Winning team with manager Len Heath giving a wry smile bringing the score to 16 Wins from 28 events since 1913, This however was to be the last year Britain was to run the Trophy in the remaining history of the ISDT. 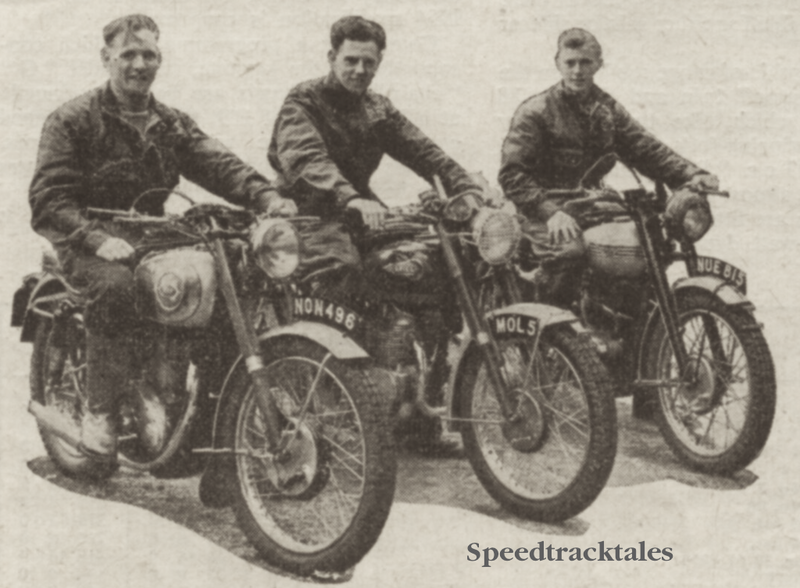 P H ‘Jim’ Alves on the Triumph, S B Manns on the Matchless, J V Brittain – Royal Enfield, Hugh Viney on the AJS, Jack Stocker – Royal Enfield. 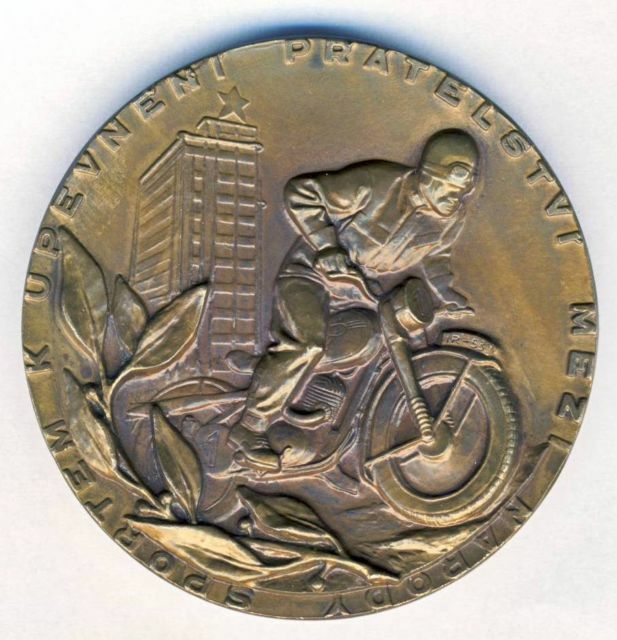 The competition with Silver Vase entries Netherlands ‘B’ plus Polish ‘B team taken by the Czech ‘B’ Team trio of Frantisek Blaha, Vojtech Kolar & Bohumil Kabat for the second year in succession on the Speed Test!. 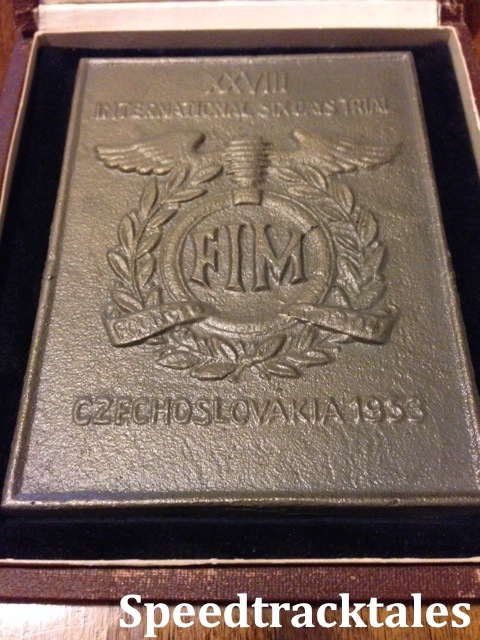 Club Team prize won by the Czech Ustredni dum armady, all riding 150cc CZs again in the Speed Tests to see off a hard riding British Silver Vase ‘A’ Team. 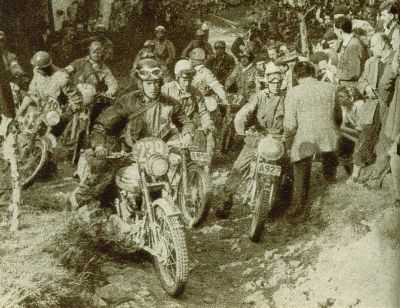 Manufacturers Teams Prizes went to Ariel , AMC (AJS & Matchless) & Royal Enfield, the 2 Czech entries Jawa & though both won through to warn manufacturers in Britain that strong commercial competition lay ahead. 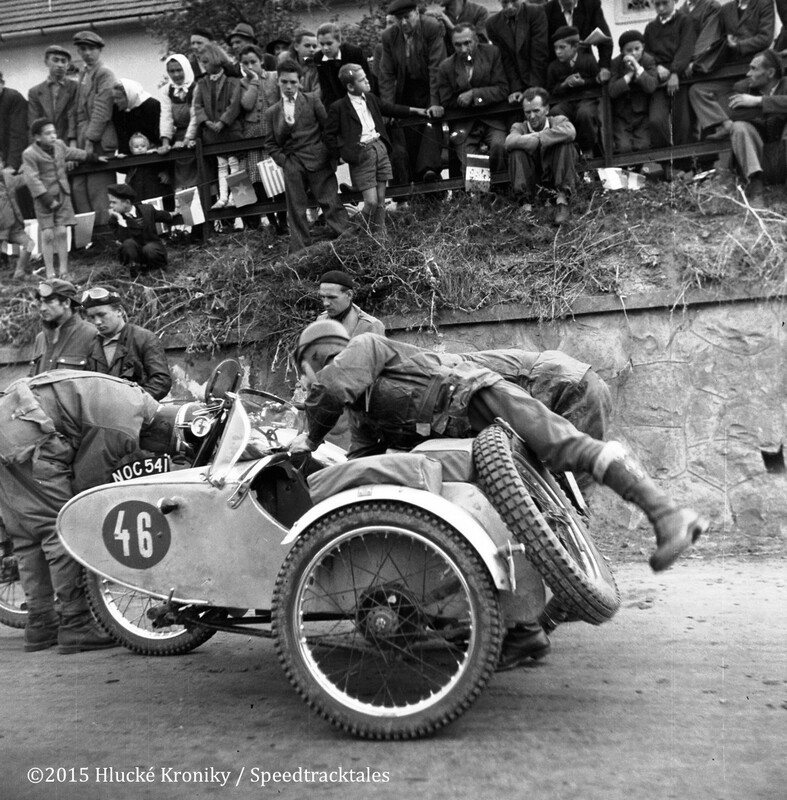 The town of Hluk in Zlin has posted an archive of old photos of the ISDT in 1953 including this picture of Geoff Wagger and Passenger with their sidecar at the check at Hulk on the first day. 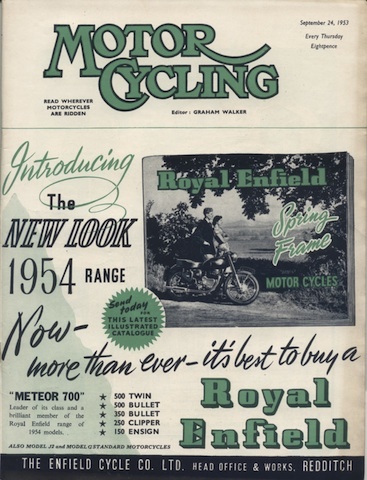 To add to confusion only Don Evans appears to be sitting on the actual bike he rode. 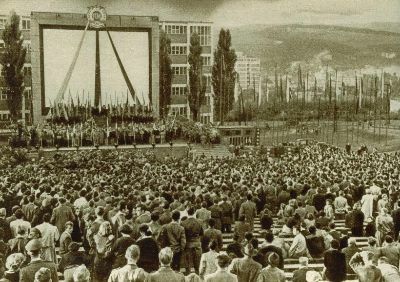 A lively official video of the event lasting 15 minutes of this important event. 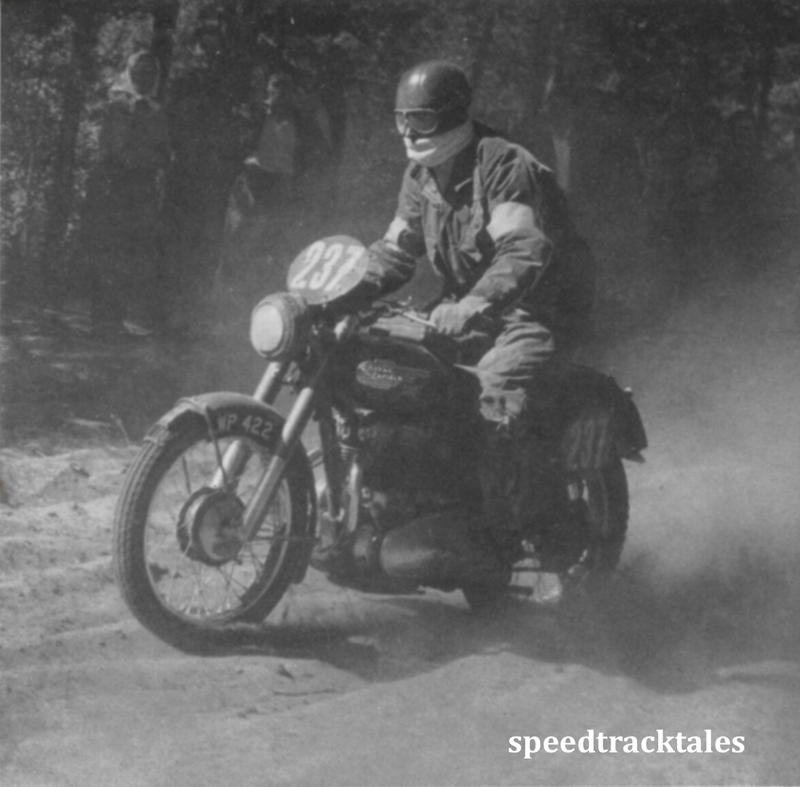 Possibly first part of a longer movie which we will keep an eye out for the rest of it. 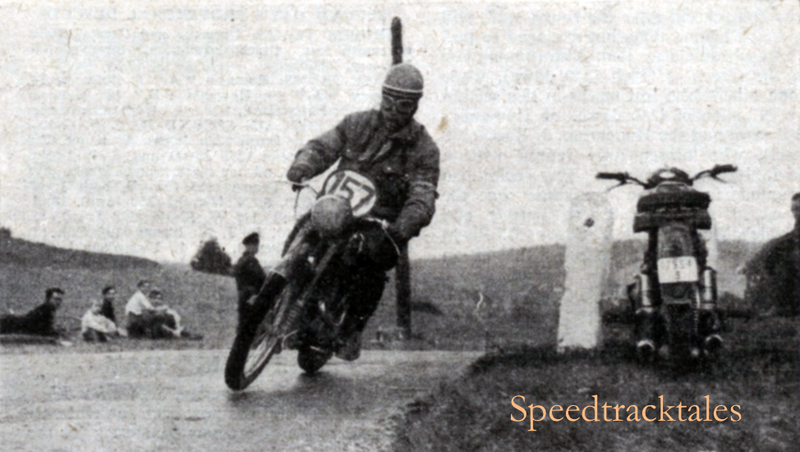 Speedtracktales wishes to thank SFB who has provided this set of results as reproduced in Motorrad. Download a copy of the original Results and Stewards Report at the link below. 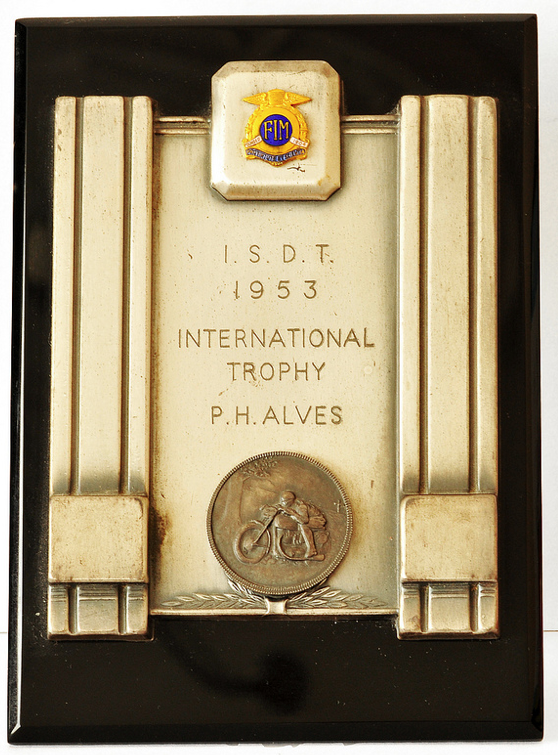 With Alves being on the Great Britain Team that picked up the International Trophy this may be an individual award given to the members of that team, no other similar trophy is known of. If anyone knows more please tell us. 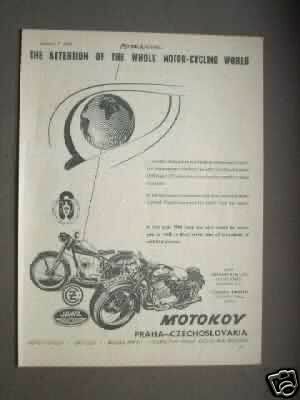 Photo of 1953 ISDT Ad seen being flogged on ebay!. 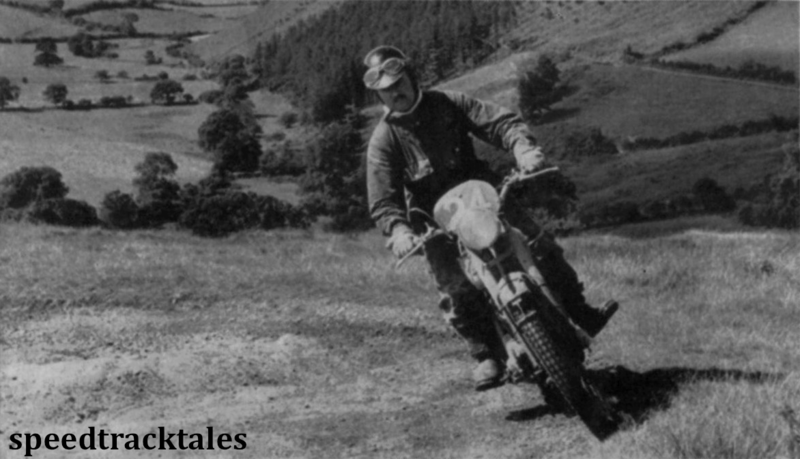 More tales & results plus anecdotes shall doubtless follow as time permits site updates & amendments, send in whatever you can re this plus other ISDT events & even others. 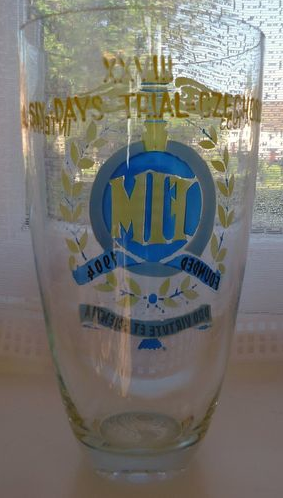 This souvenir glass vase was recently listed on eBay. 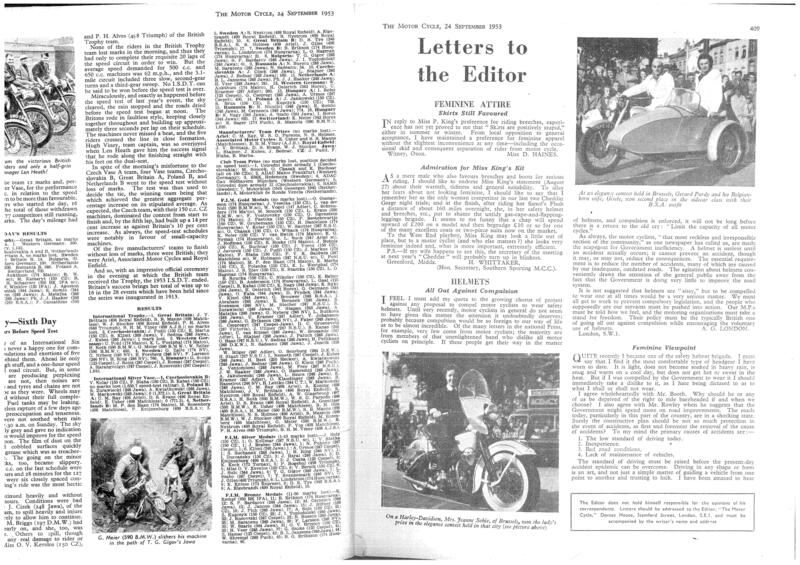 It was listed amongst a collection of items belonging to P H ‘Jim’ Alves that were being auctioned. 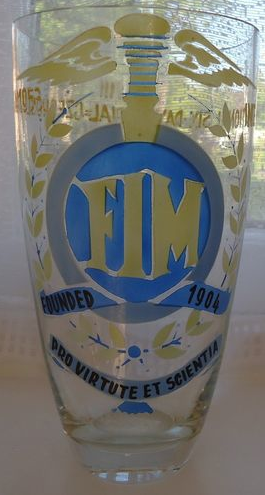 With Alves being on the winning Trophy team we don’t know wether it was a winners, finishers award or an optional souvenir anyone with the answer to this please let us know. 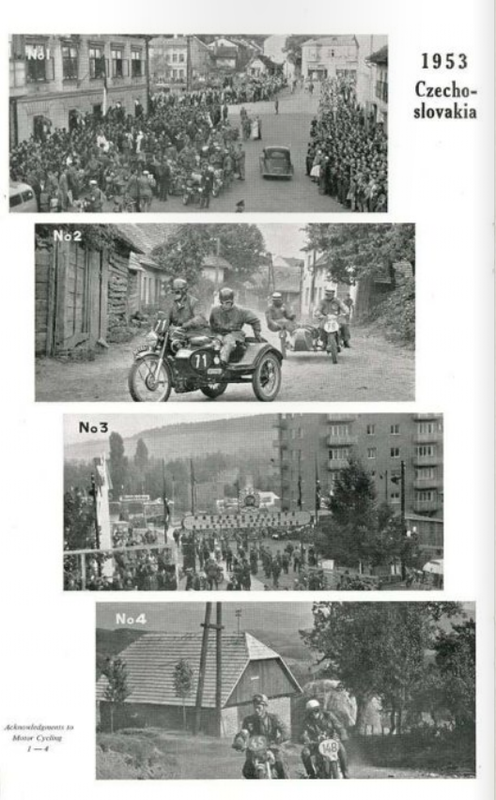 Ich suche gute Fotos von Nr. 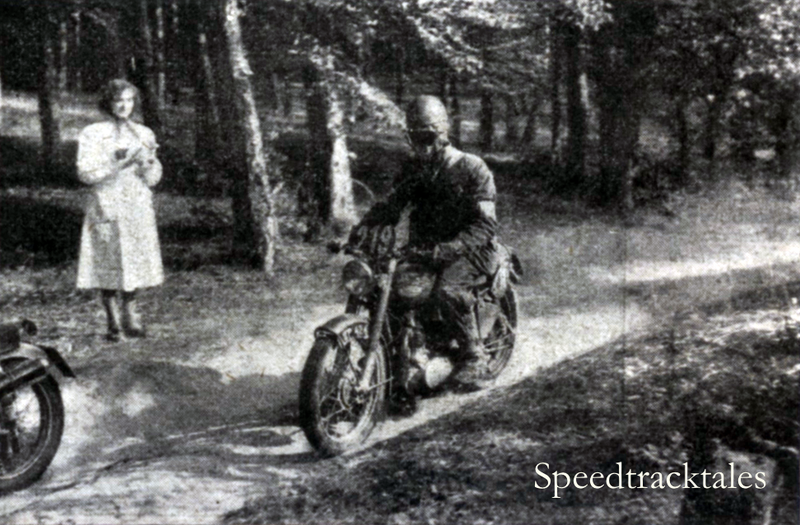 6 v/d Noll, Holland, Nr. 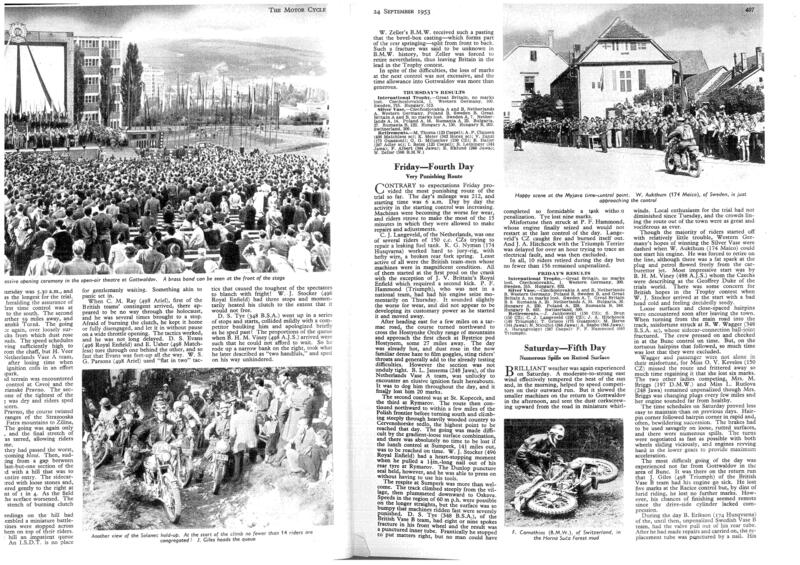 11 Kraus, Deutschland, Nr. 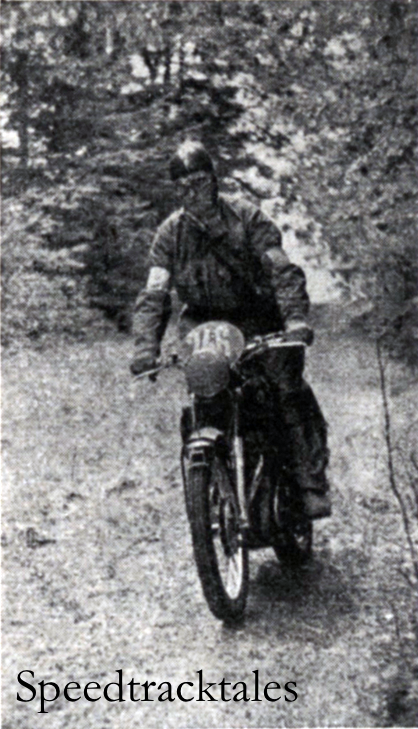 21 Meier, Schweiz, Nr. 26 Kollmar, Deutschland, Nr. 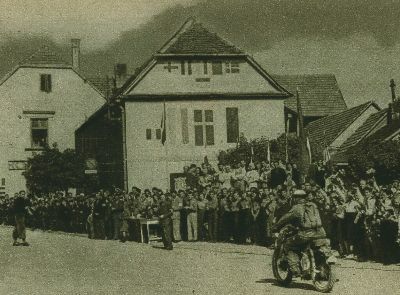 36 Sautter, Deutschland, Nr. 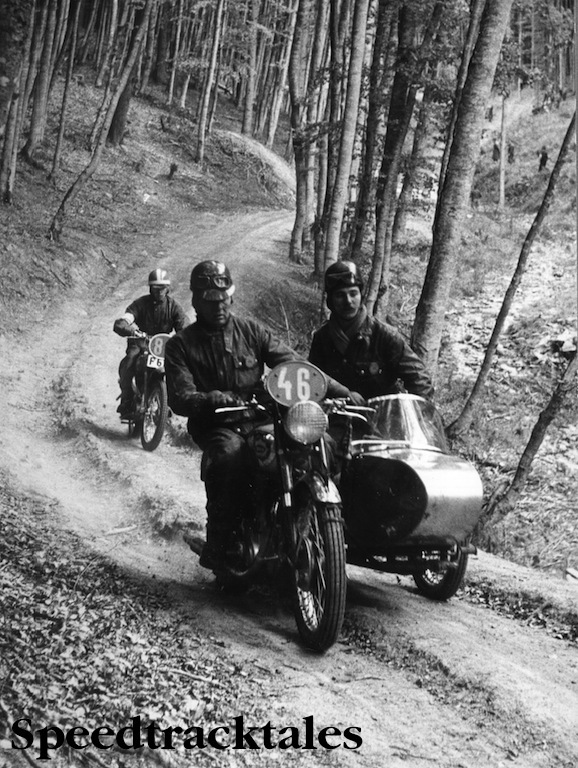 61 Haller, Schweiz, Nr. 66 Scherzer, DDR, 76 Hofmann. Deutschland.